The Cumberland & Dumfriesshire Farmers Mart P.L.C. 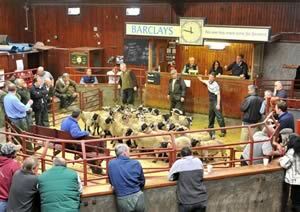 had forward 45 prime cattle, 1 young bull, 39 over thirty month cattle, 158 prime lambs, 5,284 prime hoggs and 3,467 cast ewes & rams at their weekly sale at Longtown on Thursday 20th May, 2010. Clean cattle saw lightweights sell well with heavyweights harder to cash. Heifers sold to a top of 174.5p and 173.5p for Limousin heifers from Hallburn, others 166.5p Dashwellgreen. The bullock section was all heavyweights selling to 161.5p for Limousin from Dashwellgreen and £1,310 Haining House. The 39 OTM cattle maintained late rates. Galloway bullocks to 120.5p Ottercops. Limousin heifers 117.5p High Floweryhirst. Limousin cows 123.5p Newhouse, 111.5p High Greenhill; Simmental 104.5p Newhouse; Angus 104.5p Borthwickshields; British Blue 103.5p Newhouse; Charolais 103.5p High Dovecote. Simmental cows £844 Sceughdyke; Limousin £755 Slealands; Galloway £496 Milnholm. The 158 new season lambs saw trade slightly easier on the week. Heavyweights were hard to sell with lambs only needing to be 36-44 kilos in weight. Top price of 234p per kilo for Texels from Mossband House and to £107 per head for Suffolks from Land Farm, others £99.50 Backburn, £98.80 Tone Hall; Texel £93.20 Mossband Hall, £90 Middle Shipley, £88.80 Backburn; Oxford £88.80 Guards. An excellent show for the time of year of 5,284 hoggs was forward. However, coinciding with the time of year there was a mixed show of quality. Good fleshed hoggs were readily wanted and short of buyers requirements and regularly in the 180p-185p mark. Included in the sale was 1,684 plainer types of hoggs with many consignors having a tidy up, therefore the sale levelled out at 176.6p. Top price of 230p per kilo and £108 per head for Texels from Messrs Stoddart, Hillside. Other Texels £107.50 Hillside, £100 Glendue; North Country Cheviot £100 Stackbraes, £94, £93.80 Sockbridge Hall; Suffolk £100, £99.50 Sockbridge Hall, £96.50 Riddell Farm; Charollais £95.20, £88.20 Golden Lane; Greyface £91.50 Justicetown, £89.80 Sockbridge Hall, £87.20 Glendue; Blackface £90.50 Newbigging, £86.50 Stackbraes, £84.80 Smalmstown; Cheviot Mule £90 Mains of Machermore; Leicester £90 Sockbridge Hall; Beltex £90, £82.80 Hillside; Hill Cheviot £90, £89.50 Almagill, £89.20 Bloan; Herdwick £76.50 Stonehouse, £68.50 Powheads; Jacob £75.50 Plumpe; Swaledale £59.80 Milescott, £59.50 Newbiggin;. Lightweight hoggs to £66.20 for Texels from Allerby Hall and Stonehouse; Hill Cheviot £65.20 Stonehouse, £59.80 Maidencoates; Beltex £65 Waltonwoodhead; Greyface £64.50 Stonehouse, £58.50 Crawfordjohn Mill; North Country Cheviot £62.20 Stonehouse, £52.50 Maidencoates; Herdwick £60.80 Hillside; Blackface £60 Colter Coats, £59.80 Maidencoates; Shetland £58 Butterdales; Swaledale £43.50 Newbiggin.